Everyone knows that while Husky Stadium is now being rebuilt for next year, the football team is playing its home games in downtown Seattle at Century Link Field, home of the Seattle Seahawks and Seattle Sounders. Everyone sees the UW Husky Varsity Marching Band on the stadium steps at the north entrance prior to the game, in the south stands during the game, and on the field for pre-game and half-time shows. 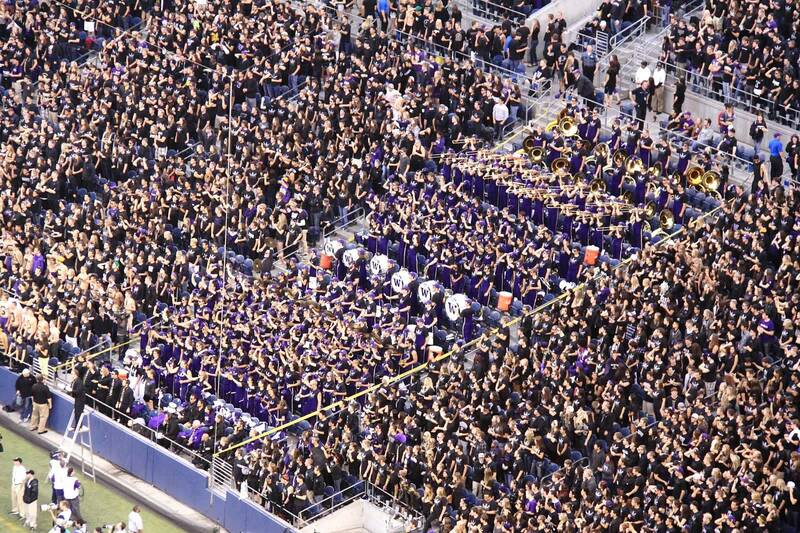 But who knows whether the Husky Alumni Band is even there—and if so, where are they? Well, yes, we were there Thursday night (27 September) to see the Huskies upset the 8th-ranked Stanford Cardinal, 17-13. We were seated in the SW quadrant of the stadium—high up in Section 327!—cheering as loudly as everyone else. We played at three pep rallies prior to the game, one with the Chinese Dragon at Hing Hay Park in the International District, one in the north parking lot of the stadium, and one in Occidental Street on the west side of the stadium. That earned us free tickets into this big game. 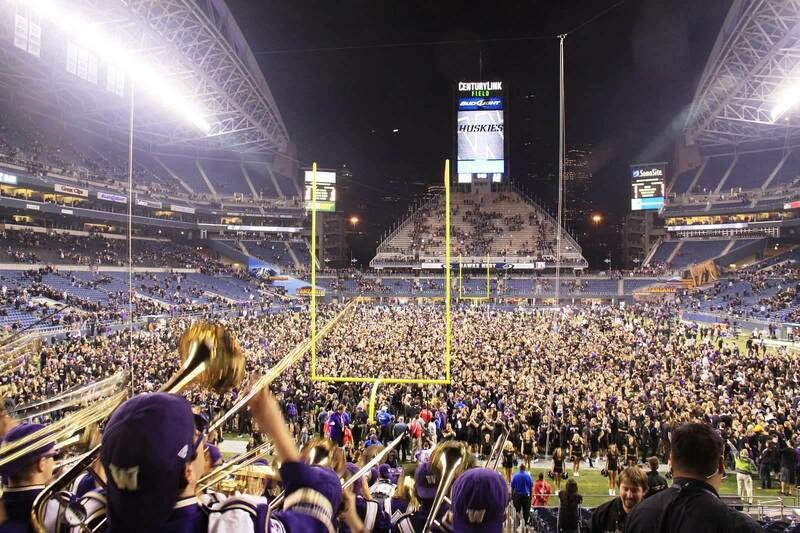 Recall that there was a time when it was questionable whether the Husky Alumni Band would have a role to play at the home games this year (see my post of 18 November 2011), but that was settled. We’re there, helping raise money for HMBAA scholarships, and we’re very happy. It’s such fun, and I love playing trumpet. Some of us even joined the massive crowd on the field after the game to celebrate the victory. Go Huskies! Photos are by Louis Figueroa and Gary Nakayama, courtesy of the UW Husky Varsity Marching Band conducted by Dr. Brad McDavid, Director. Please click on any photo to enlarge it. Leaping for the joy of victory! This entry was posted on October 16, 2012 at 11:47 am	and is filed under HMBAA - Husky Alumni Band. Tagged: alumni, band, Century Link Field, cheerleaders, Dr. Brad McDavid, Huskies, Husky, marching, Melvyn Poll, pep rallies, Stanford Cardinal, trumpet, trumpeters, University, UW, Varsity, Washington. You can follow any responses to this entry through the RSS 2.0 feed. You can leave a response, or trackback from your own site.